I had the chance to work with some of Alison Glass’ latest fabrics from her line Field Day by Andover Fabrics. I met Alison in person at Quilt Market this past spring and just adored her. She is down to earth and fun and oh so talented. I felt very comfortable with her, which can be a difficult thing to achieve with a person you have just met.She sent me a bit of her fabric to play with and I was stumped for a while I’ll admit. I had some various fat quarters from the line and I felt a bit like I was torturing the fabric. I don’t know if you know what that is like but I was overworking it and trying to make it into something rather than letting it become something. I finally had a bit of inspiration with one of her large floral prints and realized that I kept seeing it as clothing. So I begged a bit more fabric from Alison and paired it with one of her Bike Path prints that I had already bought from a previous line. And ta da!! 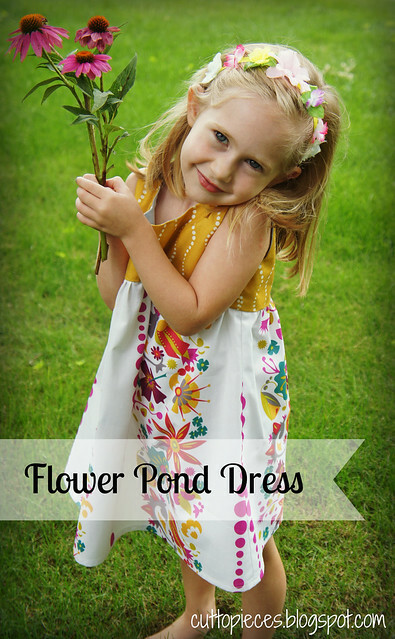 The Flower Pond Dress was born. 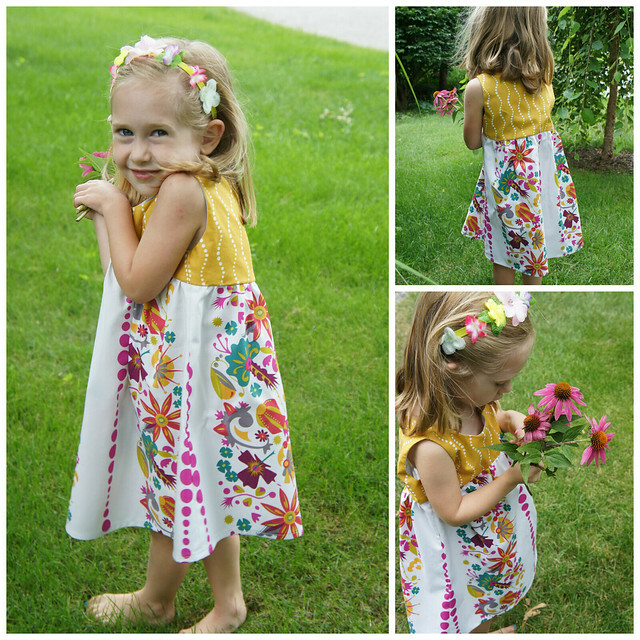 I used a McCalls pattern (6065) which is actually the same pattern I used to make Caitlyn’s Easter dress earlier this spring. I like the pattern because there are no closures to worry about but it comes off a bit oversized on Caitlyn. She’s fairly petite and should I make it a third time I would definitely make the front bodice smaller. The back is great, but the front is too wide for her petite frame. I raised the neckline a bit from the first time, and I prefer that, but a few more alterations would be needed still. Regardless, I made this darling dress. I forgot to check the colors against Caitlyn’s skin. The mustard color was a last minute design change because the fabric looked better than the pink bike path I had been planning on using. And I neglected to confirm whether my daughter actually looked good in that color. We’re not concerned over here. I make Caitlyn plenty of dresses and certainly could make this in another color. 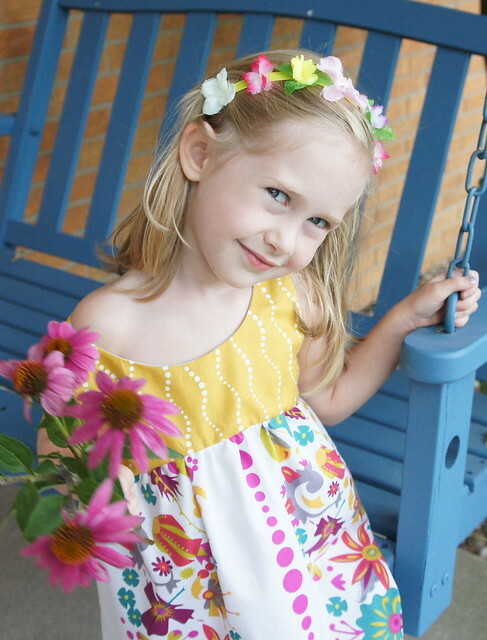 She loved playing my model and in typical four year old fashion has promptly forgotten about the dress and moved on to greener pastures (hmmm…I wonder how GREEN would look on her? ) 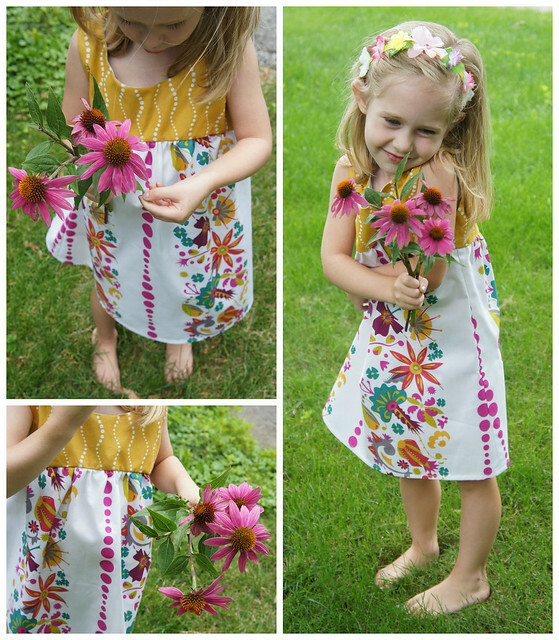 I do adore the little dress and the way Alison’s two fabrics pair together so beautifully. The large floral print is a perfect scale for garments and looks so bohemian and sweet at the same time. Ahhh….blue…there’s a color for her. Your model is adorable! Love the photos and dress. 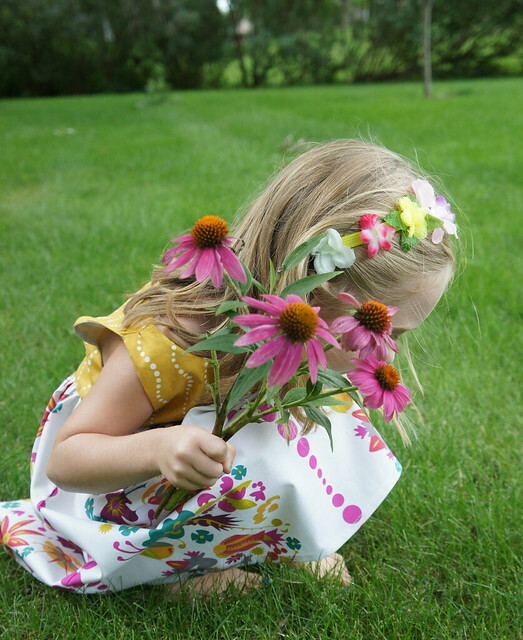 Color issues aside, it's a darling dress..(.and darling little girl in it!0 Would look great on a redhead!